Yeah the Napoleon's were small but stubborn, they kept coming back! Franco wasn't ideal but he didn't crown himself either so..
Franco didn't crown himself because he was a monarchist we could have had one of his descendants as king because his eldest granddaughter married one of Alfonso XIII's grandchildren but his father had renounced his rights because he was deaf. Though Franco could have chosen him instead of JC. Oh right I didn't know that Franco's family had royal connections..
Maybe is you ask HM nicely you can borrow Harry for a decade or so..
After that he'll go to Moscow of course to re-establish the Romanov line and create a good heir for the Russians. Harry the saviour of monarchy's all over the world! Franco's descendants have aristo and royal connections, his only daughter (who may not have been his according to rumours) married into an old aristo family and was given by JC also a dukedom. 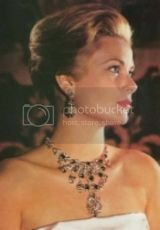 Then the oldest grandaughter married into the bourbon family but divorced afterwards. She was wild maybe you can compare her to Princess Margaret's life. Though sadder because her eldest child died in a car accident, her ex husband in a sky accident and her step daughter in a sea accident. I think the accidents are very diana-esque if you get my drift... the ex husband and heirs were always a nuisance for JC. I was happy when Luis Felipe who is the youngest son had two sons while Felipe only had two girls. Luis Felipe is also the legitimist claimant to the french crown so he needed to have boys to keep the line of succession or it would pass to JC's descendants. JC doesn't back him up and prefers the orleanists. what is so surprising? The back story in the "accidents" or the whole story being super confusing? Lot of ppl end up dead around JC first his brother, Franco's grand daughter, her son, daughter and and ex-hubby and now JC own grand son as another accident with a gun! It makes JC sound like a really creepy guy for someone who doesn't have any real power. He sounds like a 17th century royal, killing off possible competitors for the throne left and right! "Accidents do happen my dear...'insert evil laughter' "
Just curious, how old was JC when that accident with his brother happened? If it ever turns out that he is Kate's real dad, I'm on the next plane to Madrid to shoot the idiot! I don't know about Kate but he may be Harry's dad! What a vile monster along with the rest who kill and profit from these innocent animals.He also killed a bear years ago who was so tamed because he was raised by humans they drugged him and sent it to a field and shot him.I guess karma will hit all those monsters harder.